It is the classic dilemma : I like the convenience of eBooks but I love wandering around Bookshops. My adoption of eBooks was a bit of an accident. Convinced that no digital download could ever last a round in the ring with a "proper" paper/cardboard/leather - bound book, I undertook an experiment about a year ago in order to prove that Kindles couldn't hold a candle to a real book. I got myself a Kindle and made one of my famous resolutions to abandon paper books for three months and live entirely on a digital diet. At the end of the three months I rushed back into a bookshop, bought a pile of real books and wrote a post in praise of paper. It was, however, what happened after the experiment was over that was interesting. 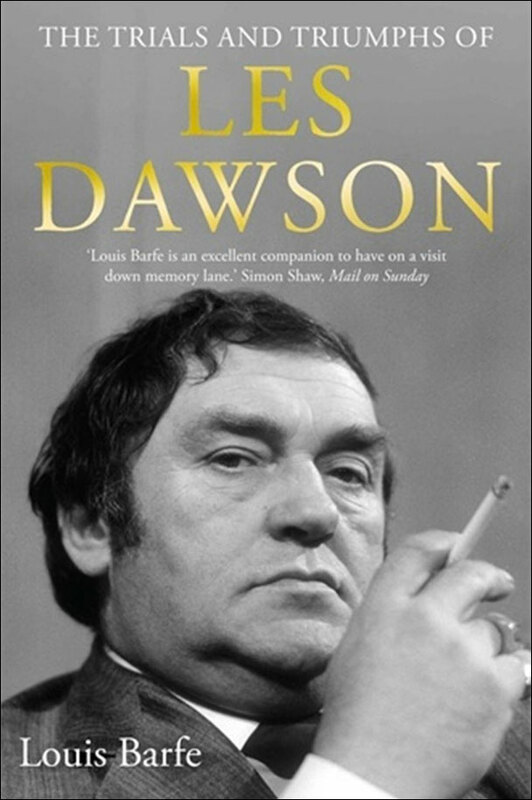 Within a week of holding one of those semi-obese volumes in my aching hands whilst trying to drop off to sleep, and within a few days of carting around a book the size of a brick, I had arthritis in my hands and a dislocated shoulder joint. I longed for the days of my feather-like Kindle that could carry a library with the lightness of a Victoria Sponge. I dusted the Kindle down, consigned the heavy tomes to the bookshelves and haven't looked back since. Although I can be easily persuaded to abandon paper and board in favour of paper-white screens; book shops are a different matter. Show me a man or woman who claims that browsing the Amazon on-line book-store is a pleasurable experience and I will show you a scoundrel. You can't pick things up, flick through the pages or come close to absorbing the very soul of a book by viewing the subliminal pattern of black type on white page. You can't discover a new author, a new hobby, or a new life-partner by accidentally skipping to the next row of the Dewey Decimal bookshelves. And perhaps most importantly of all, you can't guarantee that some silver-titled bargain is not a piece of self-indulgent plastic fronted drivel : the literary equivalent of singing an aria in a bath. 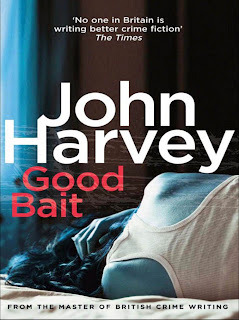 So I was reduced to doing what so many of us have probably done (and been ashamed to confess it), I would browse around bookshops, locate the book I wanted, and then scurry away like some adolescent felon and buy it on-line. After a few months of this approach to book-buying I carried a mild form of guilt around with me, and although this might not have been as heavy as an unabridged version of David Copperfield, it was a debilitating weight on my conscience. It was therefore a delight to discover yesterday, as I surreptitiously crept around my local branch of Waterstones trying my memorise titles and authors for later ordering on-line, that they have embraced changing technology and come to terms with not only the e-Book, but also the Kindle hegemony. Notices announced that I could now use their in-store WiFi to order Kindle copies of books I saw on the shelves which would be downloaded there in the shop. You got the books at Amazon prices and the bookshop got a cut of the profits. 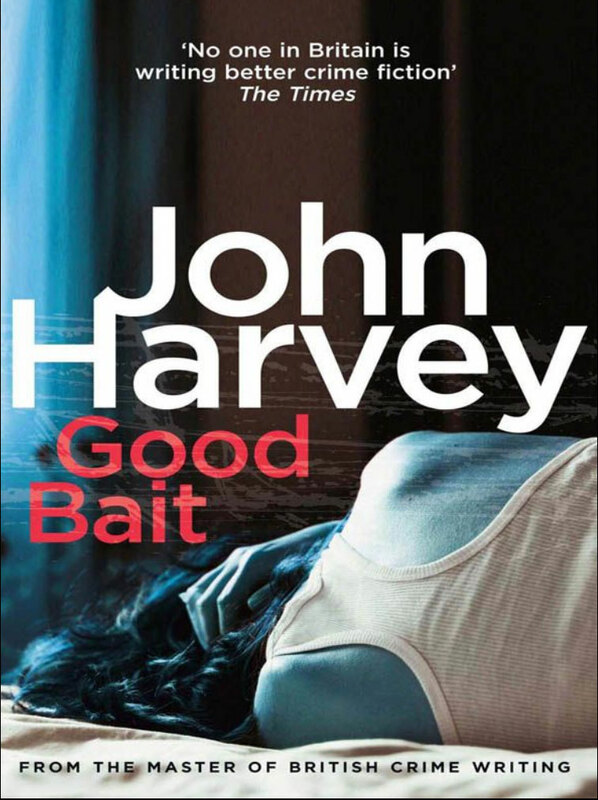 One of the bookshop assistants talked me through the ordering and download process - which was both simple and very quick - and my residual guilt evaporated like a Spring morning mist. 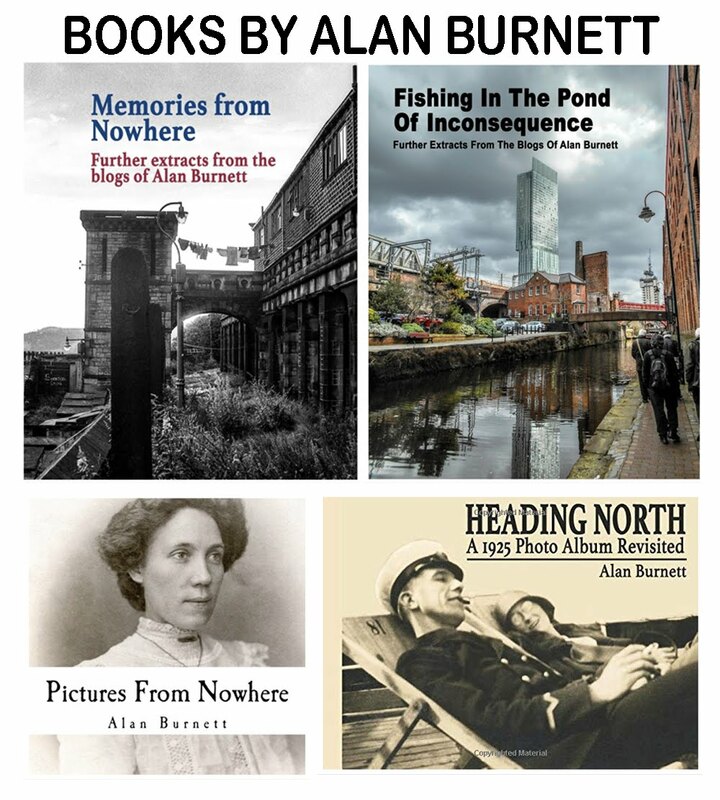 By the time I had left the shop I had added three new volumes to my digital library (the titles are being used to illustrate this post), and I could stroll back to my car without a weight either on my arms or on my conscience. I suspect I have seen the future, and it downloads rather well. As you may have noticed, I have been churning these blog posts out over recent weeks. That is because, like some adolescent schoolboy, I made a resolution at the beginning of the month to see if I could manage a post a day during January. And if you check the Blog Archive list on the sidebar you will notice that, here we are on the 30th January and this is my 30th post for the month. So what has this experiment taught me? In the first place, I have to say that it is as sustainable as making railway sleepers from elephant ivory. Even I - the man who once represented his County in the All-England Boring Championships - am running out of half interesting things to say. And finding time to put a post together each day can be time-consuming and get in the way of the important things in life such as watching football on TV or stealing beer mats from the local pubs. Having watched a television cookery programme recommending that you should bake your bread in large batches and freeze the resulting teacakes for later consumption, I decided to apply this philosophy to blogging and, earlier in the month, I wrote a series of posts and froze them by pre-scheduling their release to the world. The results were a bit like pre-frozen bread buns: a bit stodgy, a trifle dull, and slightly stale. I have abandoned this technique for both my bread and my posts and now what you get is straight out of the oven. This explains how I can respond to the last request in the comments of yesterdays' post, in less than 24 hours. This, Marilyn, is a view looking in the opposite direction through the gate and down the path. 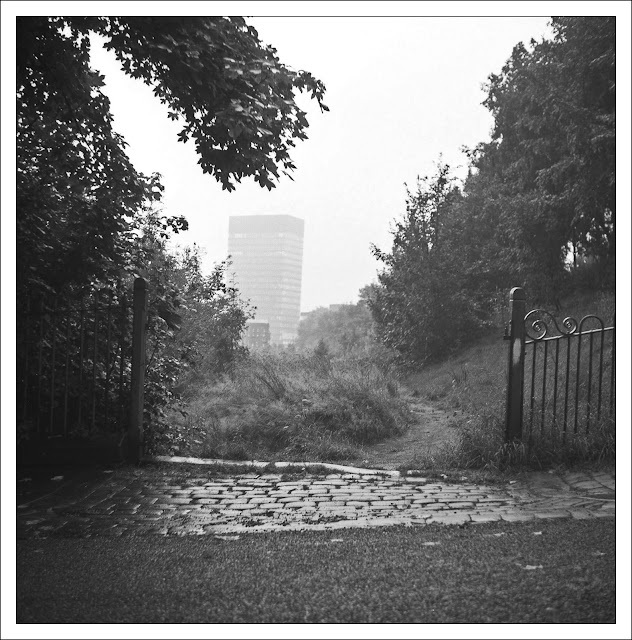 Anyone familiar with Sheffield will recognise the University Arts Tower emerging from the general fog of ignorance. There is only one day left in January, and I can promise you that, after that, things will slow down here on News From Nowhere. I will start adding artificial additives into the blogpost mixture to keep it fresh for a little longer so that no longer do I have to bake on a daily basis. A picture of the first house we owned. It is the second house down, the one with the car parked outside - although it wasn't our car. Isobel was still a medical student and I was a junior lecturer, money was in short supply. But it was a happy house in the main. The billboard provides its own commentary : laughing it, playing it ..... rocking it, rolling it, loving it. 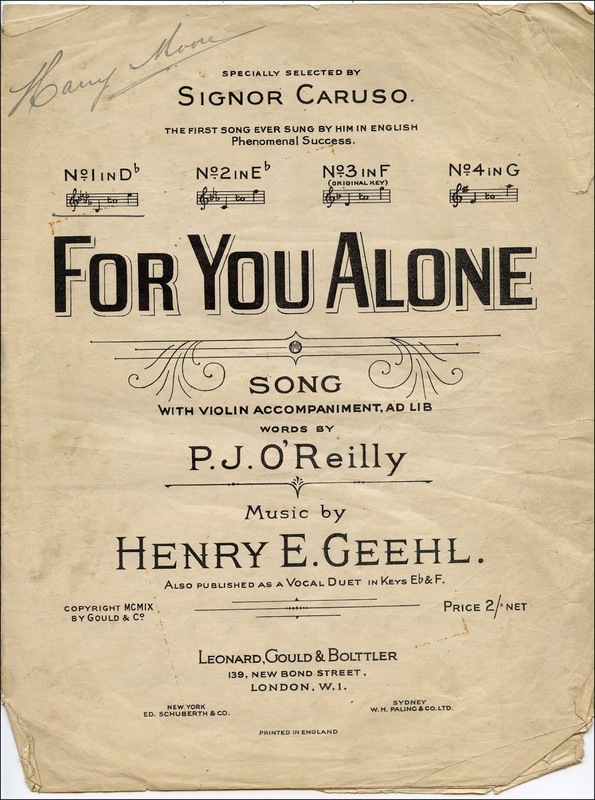 Sorting through an old box, I find some sheet music which I must have inherited from my Uncle Harry. 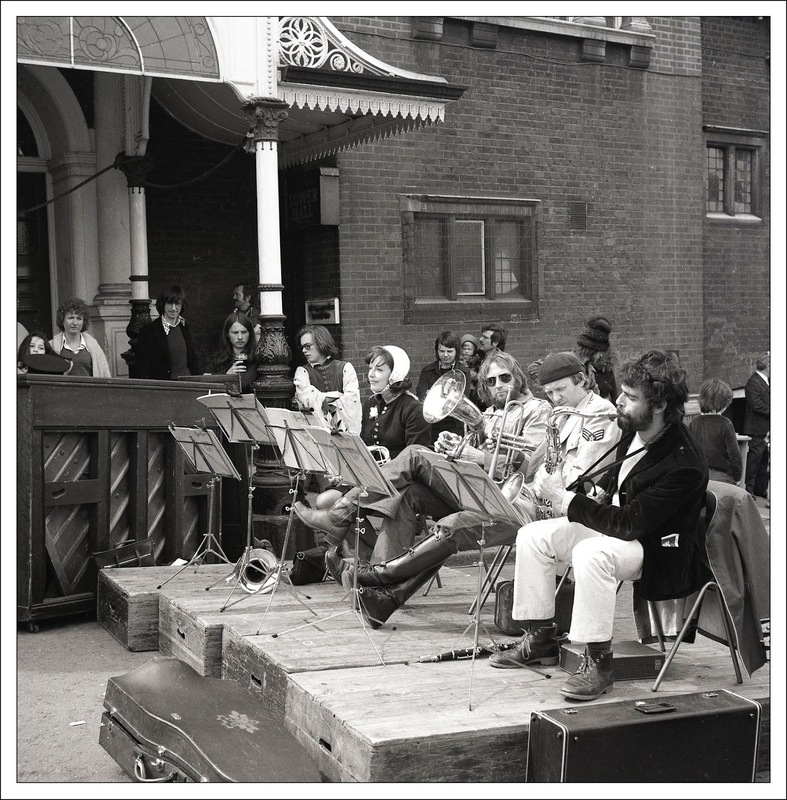 If I remember rightly, my brother got the piano, my mate Dave got the piano stool, and I got the music; which was a particularly inappropriate choice as I neither read, play nor really comprehend music. I have kept the few scraps of music, not for the content, but for the beauty of the typography. The counterpoint between the strength and richness of the main title, the delicate filigree of the underlines and the swagger of the signature brings music to my eyes, if not my ears. I wasn't familiar with the song itself, but I have managed to track down a rendition on YouTube. In truth, I think I prefer the melody of the type. One of the great advantages of scanning from 35mm negatives is that, if you are lucky, the negative will be cut into strips of six or so negatives, thus preserving the order photographs were taken. After the passage of forty or more years, this proximity can be a vital clue in trawling through your past times. 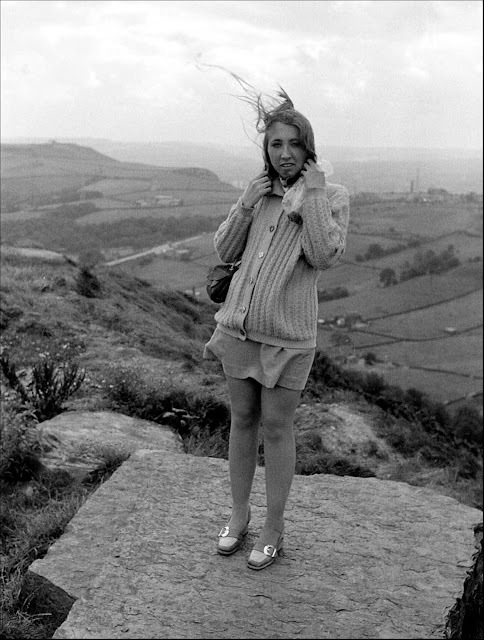 So here are Isobel and I, side by side on the moors overlooking Halifax 40 years ago. We are still side by side today. I realise that I am in danger of being accused of selecting a theme prompt to conveniently fit in with an old family photograph I have waiting up my sleeve, ready to pull out like a magicians' white rabbit. But I am innocent. Having selected the theme prompt a few weeks ago, it wasn't until yesterday that I started sorting through the shoebox in order to see if I had anything to fit the bill. And I came up with this, and it seems to tick all the boxes. It's a store-front, it has fruit and veg, it has a barrel, and it is full of faded detail. 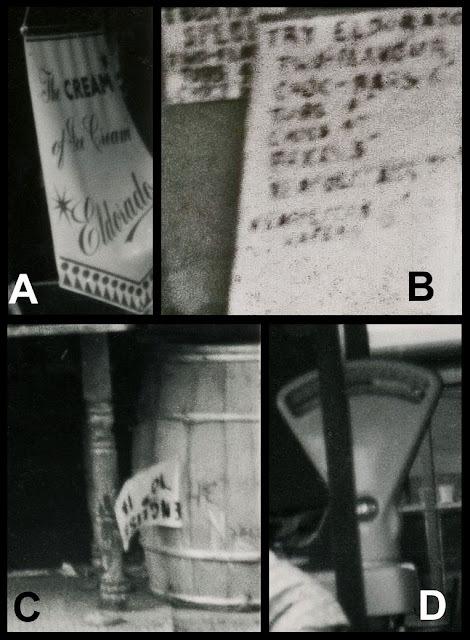 A : The Eldorado Ice Cream Company used to be one of the largest nationwide ice-cream suppliers in Britain but the brand seems to have vanished in the 1950s or 60s, no doubt swallowed up by some multinational corporation. B : As far as I can make out, their big selling point in 1951 when this photograph was taken, was that they had two-flavoured ice cream available. The list also included choc-bars, tubs and cones and this was no doubt a tempting choice in a nation just emerging from food rationing. C : I manage to match the barrel in the theme prompt but I am uncertain what the barrel contains other than the fact that it was "English". If you stand on your head you can also make out a "10" and what might be 1/- (one shilling in the currency of those days). D : There is something deeply satisfying about the shape of these weighing scales, like a vestigial memory of some comforting earth-mother. "Two ounce of sherbet lemons please"
One could, of course, go on highlighting detail and ticking boxes for ever more. But there is one box that I have to tick. As her fans will already have noticed, that is none other than Auntie Miriam there in the front of the stall. This means that it was Uncle Frank who took and filed the photograph and therefore I am able to provide you with plenty of information. 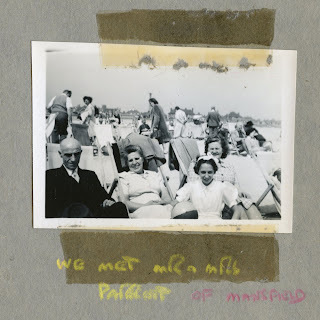 The photograph is titled "Sim and Mimi : Seacroft Camp, Hemsby Beach, August 1951". If you would like to see how other people have interpreted this week's theme, why not go over to the Sepia Saturday Blog and follow the links. And if you are a committed Sepian, you can follow all the latest news and discussions in our dedicated Facebook Group. 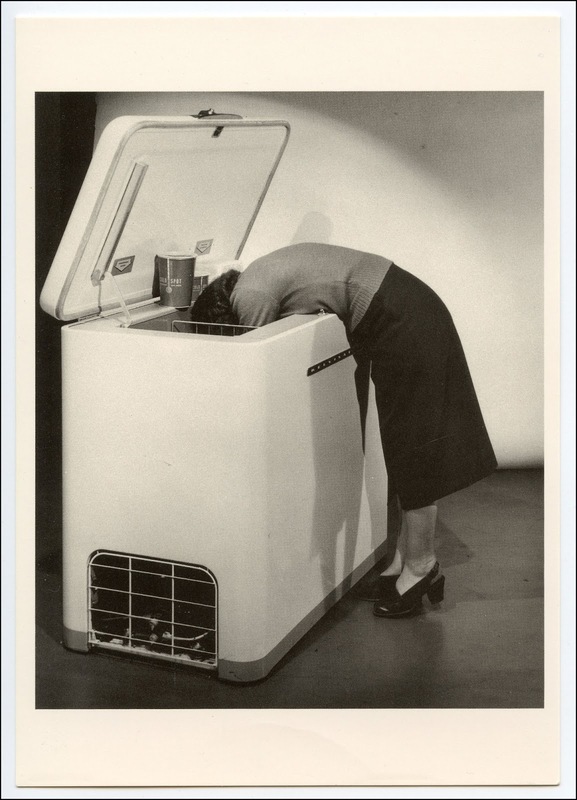 Now, where are those sherbet lemons? My computer screensaver this week dates back to February 2004. 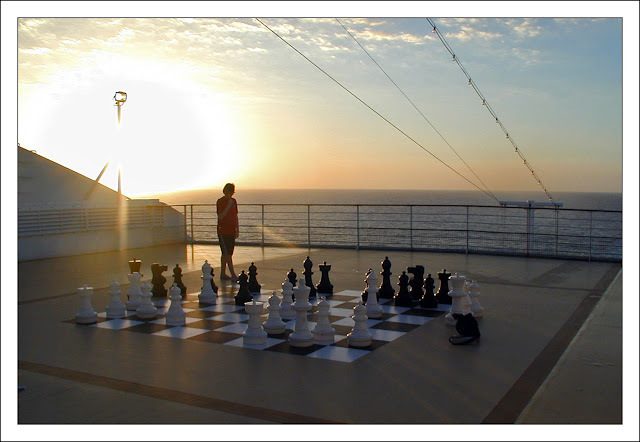 It was taken on board a cruise ship en route from Florida to Costa Rica. That is The Lad deep in thought, considering his next move. I seem to recall that he won the game. The Annual General Meeting of the West Yorkshire Chapter of the International Brotherhood (Sisterhood) of Bloggers (WYCIB(S)B) will take place at the Big Six Inn, Horsfall Street, Halifax on Thursday 31st January 2013 at 4.00pm. An invitation to attend the meeting is hereby extended to all bloggers. Agenda items should be notified to the Honorary Secretary, Mr Tony Zimnoch, before the meeting. Items already on the agenda include the election of officers and the award of the Holroyd-Hebblethwaite Trophy. At 8.10, I set off to walk. 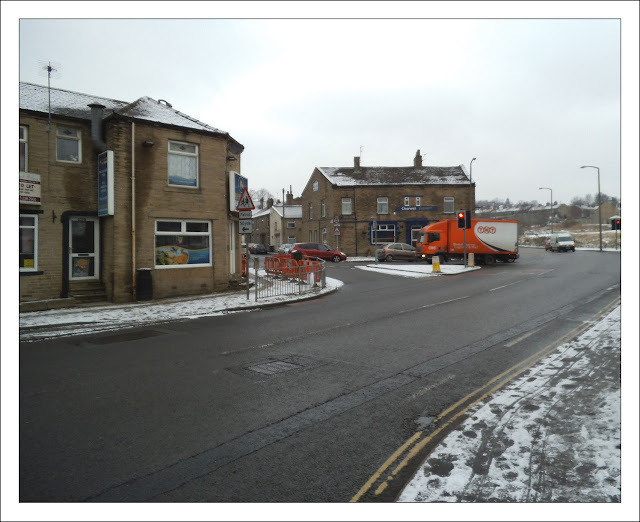 Went to Bailiff Bridge to see the new road they are making there to Brighouse and which, when finished, is to extend from Bradford to Huddersfield. It will not be done till next summer or autumn. Under the superintendence of Mr Platt of Bradford; appears from 42 to 45 ft wide .... Saw one man at his work breaking stones for which he has 5/- a rood ... After stopping to talk to the road-men and Jackman. got home at 11 3/4. At 10.30, I set off to walk. Went to Bailiff Bridge to see the road there. Last night whilst reading Anne Listers' diaries in the bath, I discovered that the road was 190 years old, so I thought it was long overdue a birthday party. 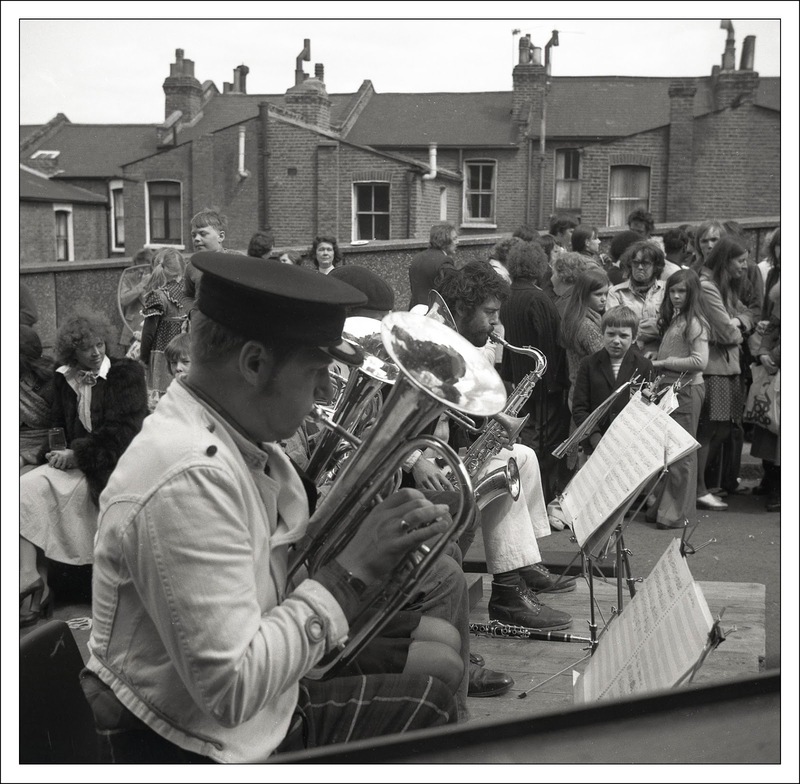 If you've ever tried to organise a birthday party for a road, you will no how difficult it is : especially on a bitterly cold day with little or no notice. I was the only person to turn up, but I did manage to sing a chorus of Happy Birthday. Got home at 12 3/4. I seem to recall reading that, towards the end of his life, President Lyndon B Johnson grew fond of attending funerals. These were not necessarily funerals of people he had known nor were they the funerals of the great and the good in society. Many a lowly Texan family would be somewhat surprised to discover the Ex-President and his entourage gathered around a small family graveside. What, you may quite legitimately ask, has this got to do with pubs? Nothing other than the fact that I find myself drawn to dead and dying pubs and somehow compelled to take pictures of them. Here is a selection from the last few weeks. As my message suggests, I have "form" when it comes to postcard sending. Many years ago I was sat in Brussels in the midst of a boring EU meeting when I decided to write a novel. 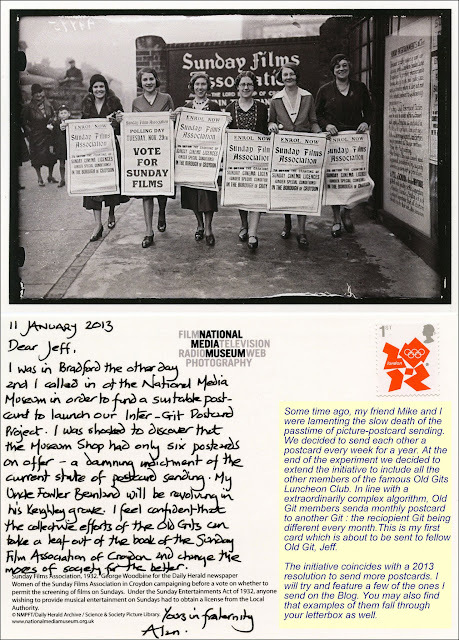 All I had to hand was a picture postcard, so I wrote the first few paragraphs on that and then sent it to my friend Martin M. A few days later I composed the next few paragraphs and the most natural thing in the world seemed to be to pen them on the back of a postcard and send them to Martin. As so I continued, for a further 150 postcards. Sadly, the project was never finished (projects rarely are with me). 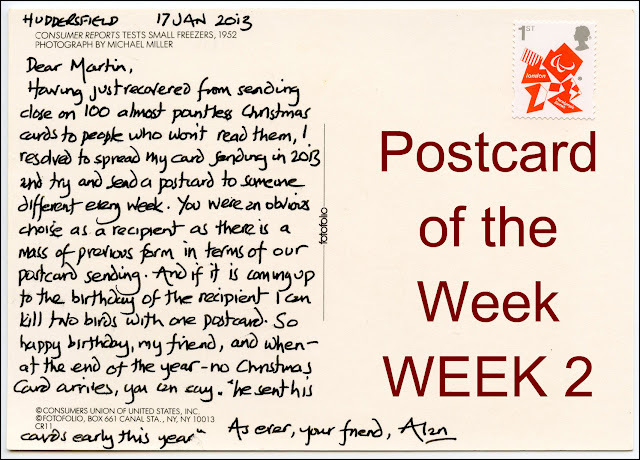 Martin, however, was a fairly obvious early recipient for my 2013 Resolution to send a postcard every week. Looking at the above image you might be tempted to accuse me of Photoshopping it. You can achieve this somewhat impressionistic appearance by selectively using the various "art" filters on Photoshop: indeed I have used them myself on many occasions to brighten up a dull shot. It would appear, however, that you do not need to invest in Photoshop to get the same effect - simply have your camera out of focus and allow your hand to tremble a little when you press the shutter. This was true of the days when cameras had manual focus lenses and shutters that had to be physically set. These days, there is a digital filter for it. The picture was taken in Paris, during my honeymoon there in 1973 (as good as an excuse for camera shake as I can think of). I have just realised, that is forty years ago : I must make a note to myself in my on-line digital diary to remember my anniversary later this year. I nearly didn't get chance to feature my screensaver for this coming week. 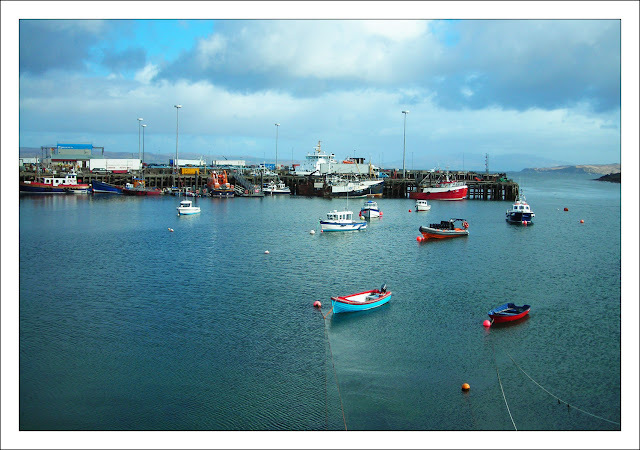 Here it is : it is a photograph I took in Mallaig, Scotland back in April 2006. The weather was glorious, the scenery was breathtaking. Just after taking the photograph I was able to take one of those boats and cross to the Isle of Skye. It is a visual memory which will keep me warm and content for the week ahead. I am on the beach again this week for Sepia Saturday, although the focus of attention is not just on those in the forefront of the photograph. The possible themes for SS160 include what is going on in the background of pictures and people facing in different directions. My chosen photograph comes from the collection of my Uncle Frank Fieldhouse : and yes, the good news for all of her many fans from around the world, is that it features Auntie Miriam (front, right behind the girl with the big bow in her hair). Being one of Uncle Frank's photographs, I have a mass of information about it. 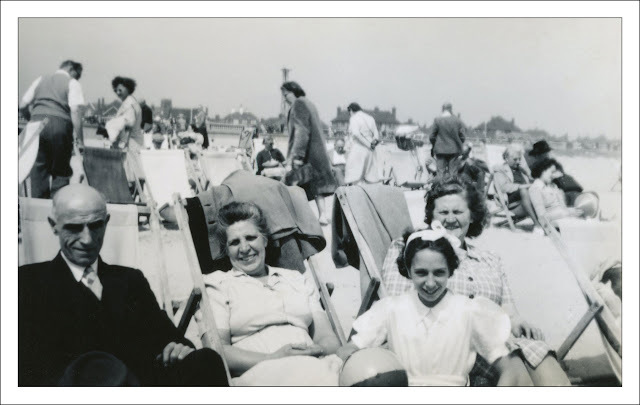 The album page is headed "We went a few times to Caister On Sea but it is only a small place" and it is dated July-Aug 1948. As you can see, whilst they were at Caister they met Mr and Mrs Parrot from Mansfield - and one assumes the little parakeet with a bow in her hair. 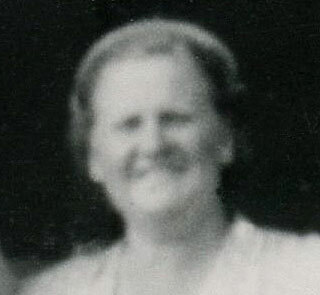 The original photograph is only 3 inch by 2 inch, but a good scanner can bring out so much detail from a photograph. Look at Mr Parrot with his bowler hat, the very picture of a bank clerk or a public drains inspector on holiday. 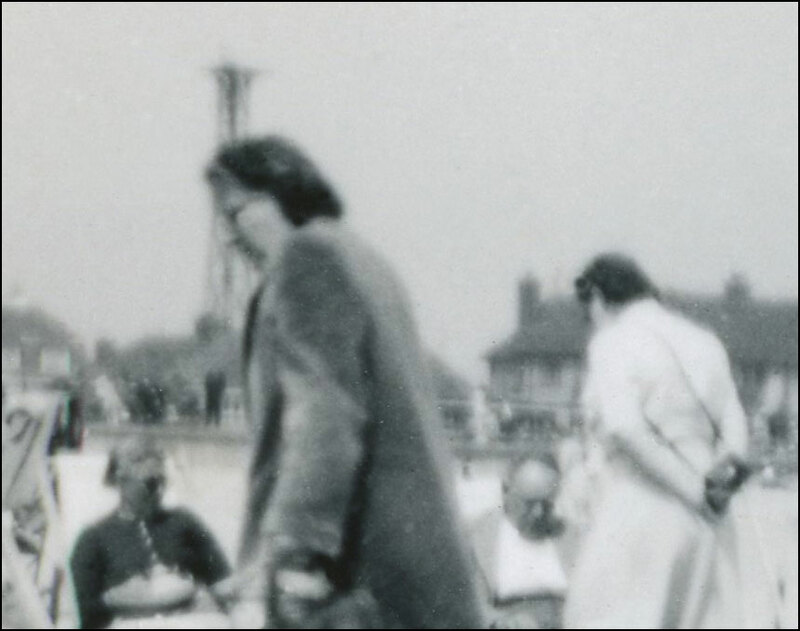 Look at the thick coats slung over the back of the deck chairs, protection against that wind blowing in from the North Sea I spoke about last week. But look at the background : people going to the left and people going to the right. People reading books and people gently nodding off in the afternoon sun. It all looks so long ago, another time in history, so long before we came into this modern world. But the Frankian precision of the dates allows me to say that, just as this photograph was being taken, a young lad was coming into this world in a grim mill town, some hundred miles to the north of here. One day that young lad would browse through the dusty albums his Uncle Frank left him and wonder to himself, what was going on in this photograph? You can see how other people from all around the world are interpreting this weeks' Sepia Saturday theme image by going along to the Sepia Saturday Blog and following the links. Time for a quick update on a couple of photographs I have featured on News from Nowhere recently. The other day I featured a picture of Halifax Piece Hall which I took back in the 1960s. When I was in Halifax the other day I called in and took this modern view from approximately the same location. If you leave the actual Piece Hall building out of the equation, so much seems to have changed. All the market buildings are gone, as are so many of the chimneys and cooling towers in the background. Even the Piece Hall itself has had a good clean, high pressure water hoses having removed centuries of ingrained soot and dirt from the stones. And I have found another photograph from the ones I took of the mysterious band which I featured a couple of days ago. 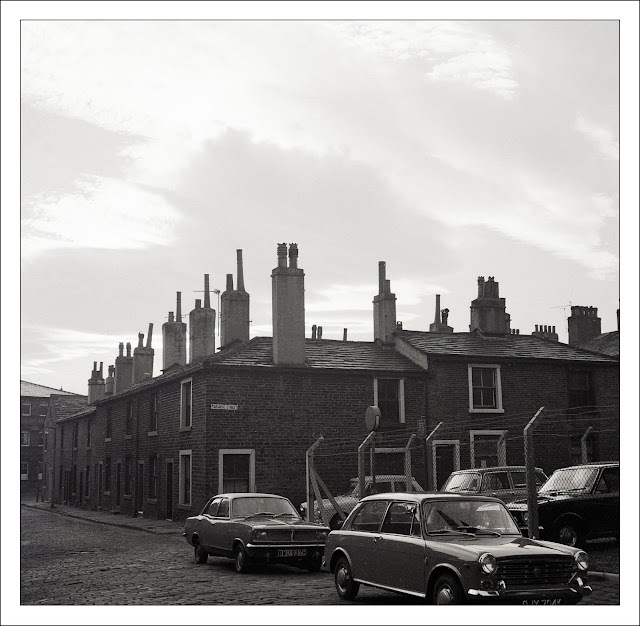 This second photograph is taken from the opposite direction and provides us with a view of the terraced houses in the background. If we are right in thinking that I took the photograph in the early 1970s, it could possible have been taken in West Yorkshire (my home), Staffordshire (where I was at University) or London (where Isobel was at University). I don't know quite why, but if I had to bet money on it, I would probably put my money on Staffordshire. There is a feel of the Five Towns in those background houses. 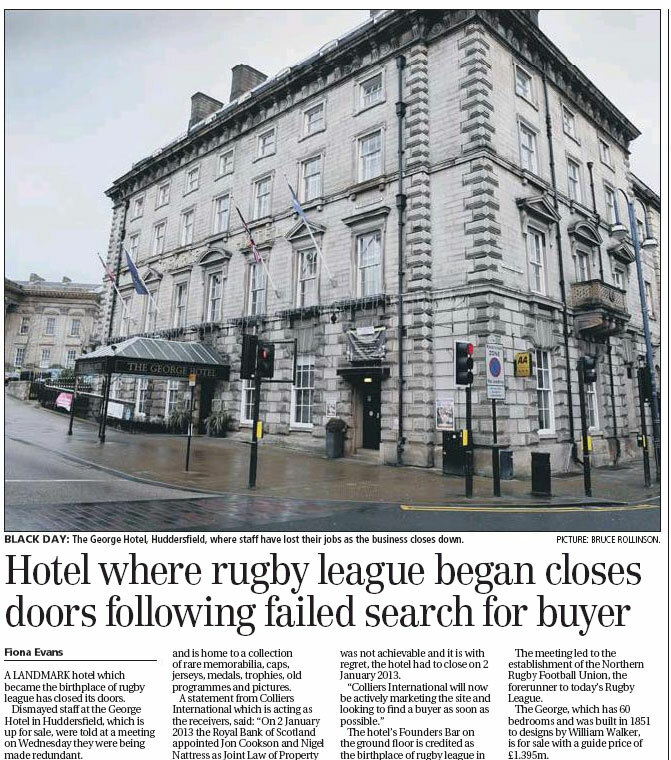 The other week everyone in Huddersfield got a bit of a shock when the town's leading hotel, the George Hotel, closed its' doors for the last time. The George had always been a part of the very fabric of the town : one of the four stone horsemen of the apocalypse that is George Square. The George had a bar, but it wasn't exactly beer-friendly and I have to confess I had only visited it on a couple of occasions. So now I have to wait to see if a rescue bid can be put together to save the hotel and the Rugby League Museum (the Rugby League was founded at a meeting in the hotel) that is situated in the building. I will keep you informed of what progress is made in securing the future of this fine building. The events surrounding the George made me think about the fragile state of many of our old Victorian hotels, and the bars that form such an important part of them. 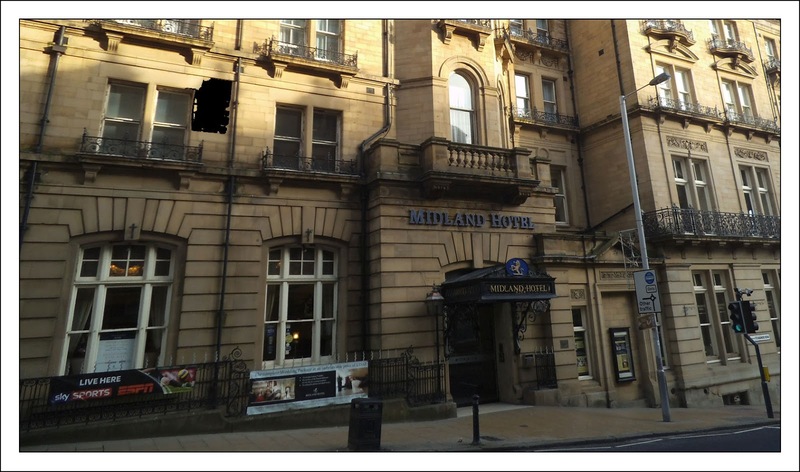 Therefore when I was visiting Bradford last week, I made a point of calling in for a pint at the splendid Midland Hotel in Forster Square. It has a bar and it had some decent real ale to offer and therefore I was able to enjoy a pint of Saltaire Blonde. The public bar is large and well proportioned and very hotel-like, which made it a fine venue to settle down to a relaxing read after a morning of book-shopping. It is the external architecture of the building that is most striking : golden stone towers and balconies that are a joy to the senses. It is all too easy to step back and think that craftsmanship like this is a thing of the past in this mass-produced, profit orientated, disposable rubbish world that we live in. 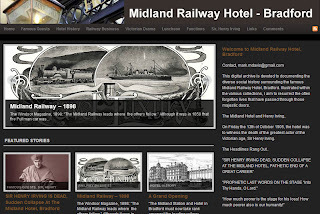 When I got home I turned to the Internet to try and find out a little more about the history of the hotel and I discovered a web based digital archive devoted entirely to the hotel and its history. And what a web archive it is, beautifully put together with fascinating content and comprehensive coverage. 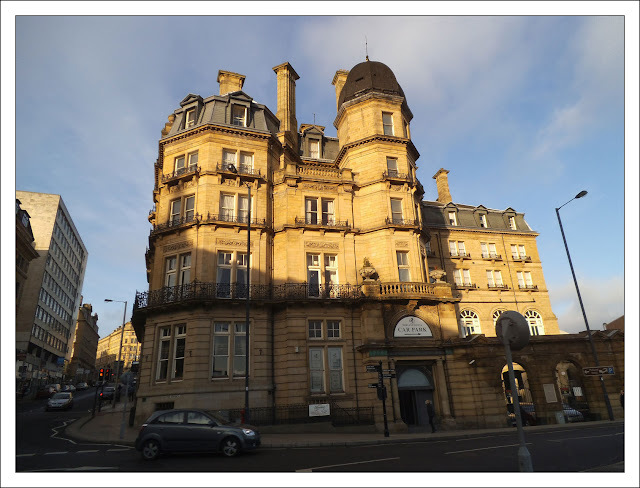 And it would appear that the site has been put together for no other reason that a love of the building, the city and their fascinating history. We may not build great Victorian public palaces any more, but the construction of such a website as this is truly a joy to the senses. 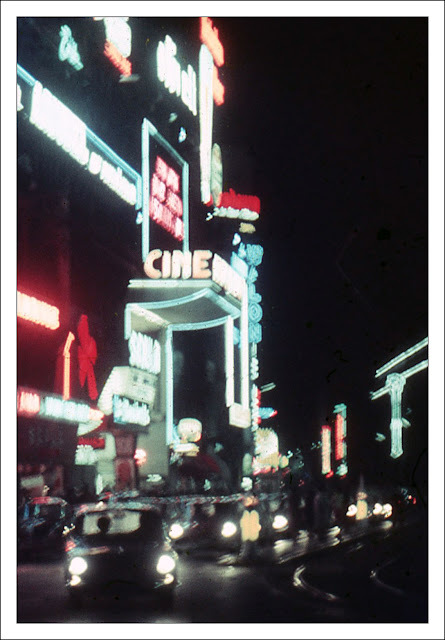 I normally have a pretty good idea of where and when I took my old photographs, even when re-visiting them via the scanner some forty or so years after they were taken. But this one has me stumped. I have tried to recognise the building in the background, I have tried to guess the time from the clothing : but nothing helps. 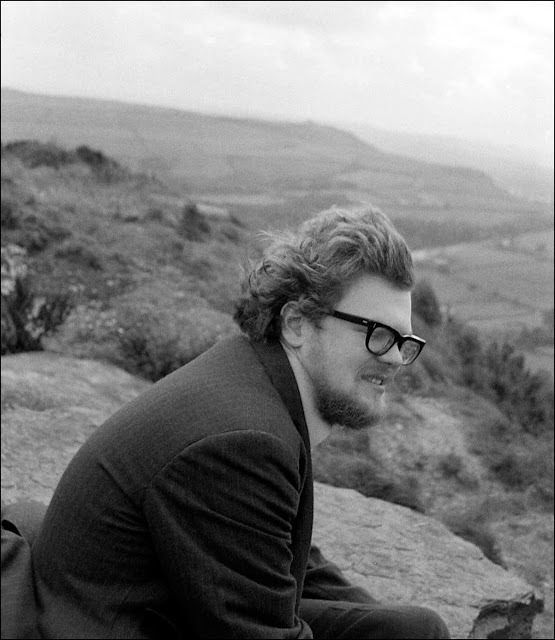 It was undoubtedly me behind the camera - but who knows where or when. Halifax Piece Hall was built in 1779 as a market for the trade in "pieces" of cloth. Over 300 trading rooms were built around a large central courtyard, creating, what is, one of Britain's finest examples of Georgian commercial architecture. During the nineteenth century the large central courtyard was often used for religious gatherings and popular entertainment - the tightrope walker, Blondin, walked on a rope strung from side to side in 1861. 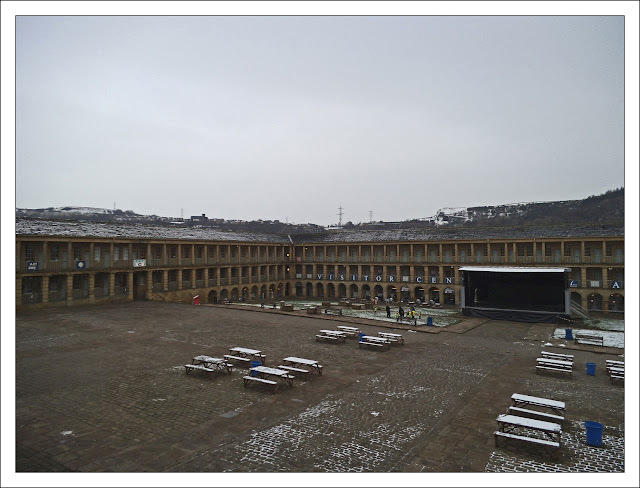 By the end of the nineteenth century, the need for a cloth trading market was long gone and, sadly, in 1871 the Piece Hall was turned into a wholesale fruit and vegetable market. It retained this use for 100 years, and my photograph shows it in the 1960s when it was the home of potatoes and carrots rather than woven cloth or revivalist meetings. 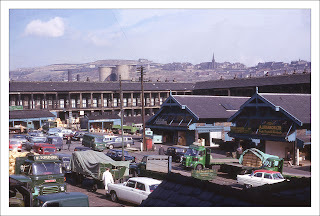 The wholesale market closed down a few years after I took this photograph and the Piece Hall enjoyed a brief revival as a thriving antique and craft centre. A few of the side rooms are still occupied, but the building is once again in search of a new use. The full history of the building and proposals for its future can be found HERE. Last Sunday I attempted to add to the general happiness of mankind and the cultural richness of society by scanning and making available, free of charge and with no copyright restrictions, the image from one of my old vintage postcards. Alas, all to soon, it was pointed out by the encyclopedic Brett Payne, that my image of "Minding Baby" had already been published on the website of the Irish Wolfhound Club of Switzerland. There is nothing I like more than a challenge, so I will continue featuring scans from my old postcards until I can come up with a genuine "First on the Net". This week I am abandoning cute animals for a picture of one of the great architectural wonders of the world -the footbridge in Rochdale Park in Lancashire. 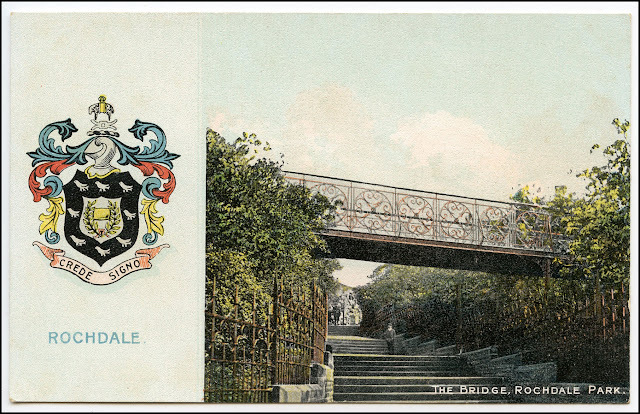 I have had a quick Google search and I can't find any other mention of this image, so, until someone tells me to the contrary, here is my contribution to the cultural heritage of the world - a park bridge in Rochdale. Our Sepia Saturday prompt this week sees a charming young lady sat on a beach. 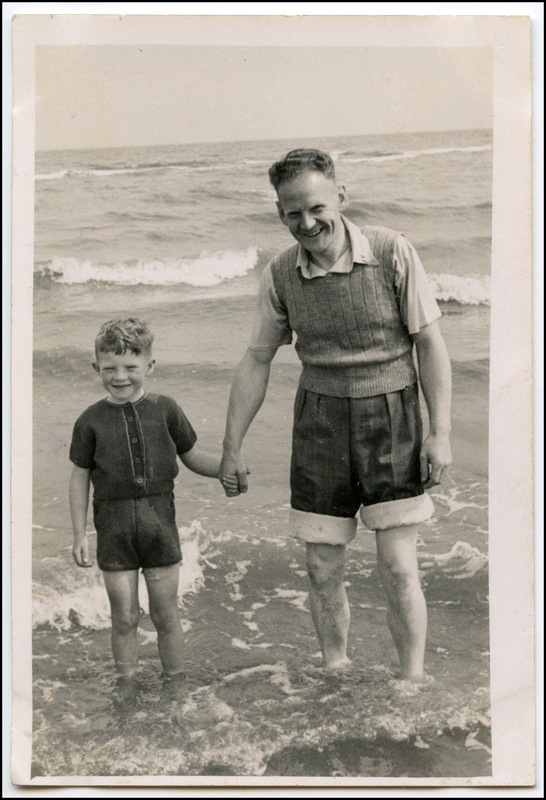 My contribution is a picture of my father and my brother, feet in seawater, enjoying the invigorating effects of the North Sea on their extremities. Some may shout about the benefits of steaming spa pools, others may pay tribute to the soothing properties of Epsom Salts or Detoxifying Essential Oils, but if you want to turn a boy into a man, let him dangle his feet in the freezing cold waters of Bridlington Bay. The picture must have been taken in about 1950, and I suspect it was taken in Bridlington which was the holiday resort of choice for our family at the time. Other than the slightly sloping horizon, it is a surprisingly good photograph and I wonder whether it might have been taken by my Uncle Harry (see my post from yesterday) who would often accompany us on holiday along with his wife, my fathers' sister, Annie. 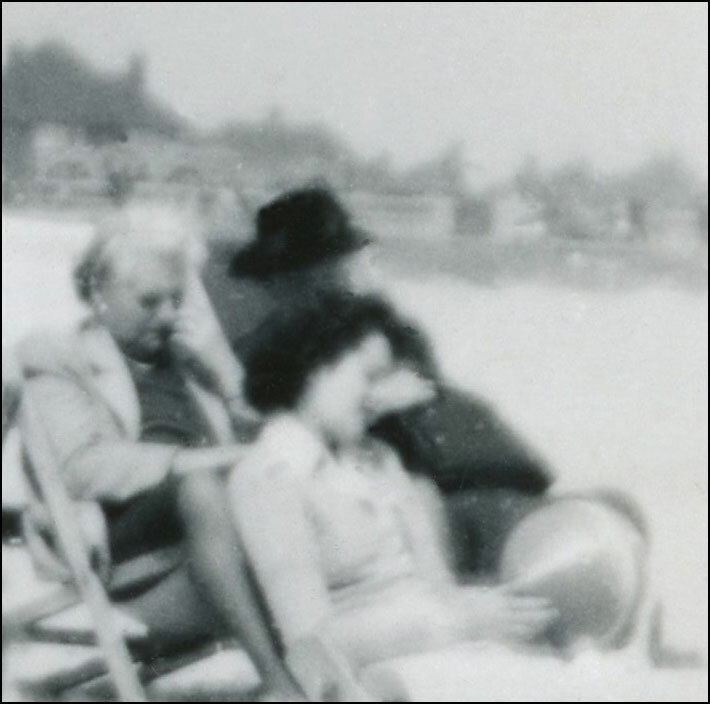 And if it was taken by Uncle Harry, it would complete a neat family triangle, because I have to confess that the bathing belle in the prompt photograph is my fathers' other sister, Miriam. 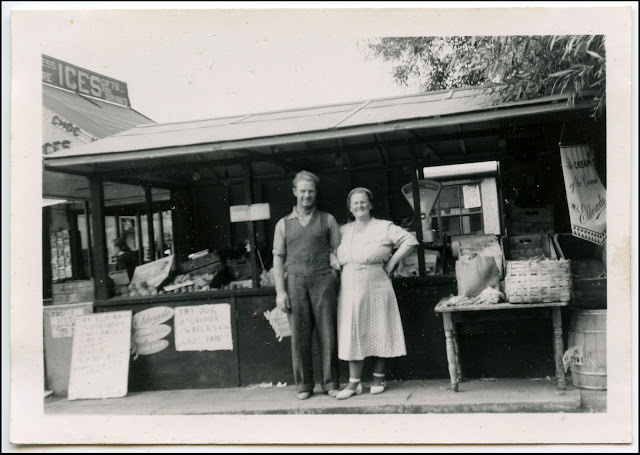 If you are fed up with my family (and I wouldn't blame you) paddle on over to the Sepia Saturday Blog and take a look at loads of other contributions to this weeks' Sepia Saturday, none of which will feature any more of my uncles or aunts. I bought a new jacket last week. We were walking around Boundary Mill in Colne when I saw a jacket and it seemed to shout out "buy me". There was something familiar about it, something comforting, something substantial. I felt as though I might have owned it for generations, but knew I hadn't done so. 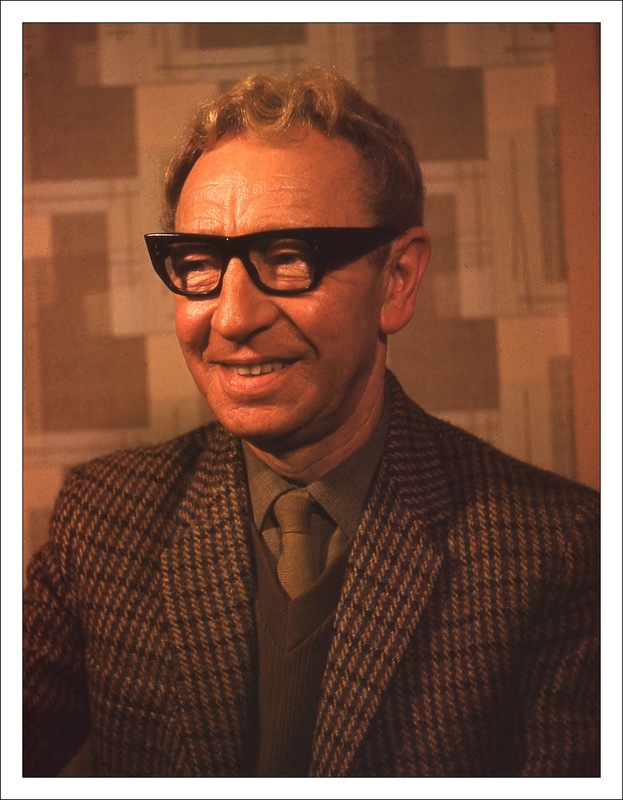 And then, today, looking through some old 35mm slides I took back in the 1960s, I came across this portrait of "Uncle Harry". He is wearing my jacket : the same tweedy weave, the same Autumnal shades, the same classic cut. Perhaps I should now hunt out the shirt, tie and pullover. But I think I will give those glasses a miss. 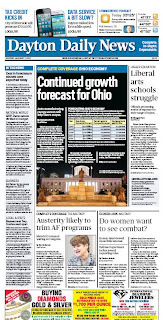 I have to admit, I am a newspaper junkie. If eyes are a window to the soul, then a daily newspaper is a window to the soul of a nation. Whenever I am on holiday I will seek out the local newspaper and devour it like a big bad wolf devouring a chicken nugget. If it is written in English, so much the better, otherwise I will look at the pictures and try to guess what the story might be about from the slightest of clues. My love of newspapers is not based on the physical properties of paper and ink. 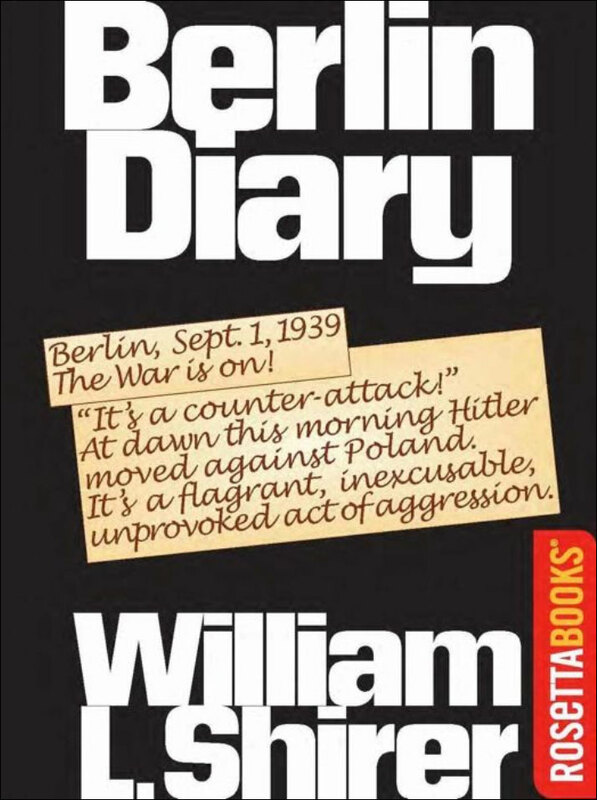 Whilst I will admit that there is a decent argument for choosing fine leather-bound books rather than their digital, electronic cousins, it would be a perverse fellow who was drawn to the arm-arching broadsheet or the ink-dripping tabloid. So you might think that I would be a fan of electronic news sites or tablet versions of existing newspapers. This, however, is not the case. 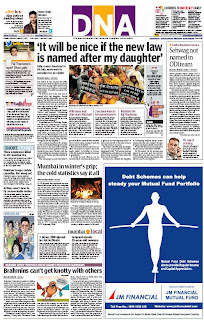 There is something about the layout of the traditional newspaper - the jumble of words and images, the multitude of columns - which is not replicated in on-line news sites. And so after experimenting with everything from Kindle newspapers to news aggregators, from iPad editions to Google Reader, I have returned to my first love, the service provided by PressDisplay.com. Be warned, subscriptions are not cheap, but fixes seldom are for us addicts. Press Display gives its' subscribers unlimited access to something like 2,000 newspapers worldwide. 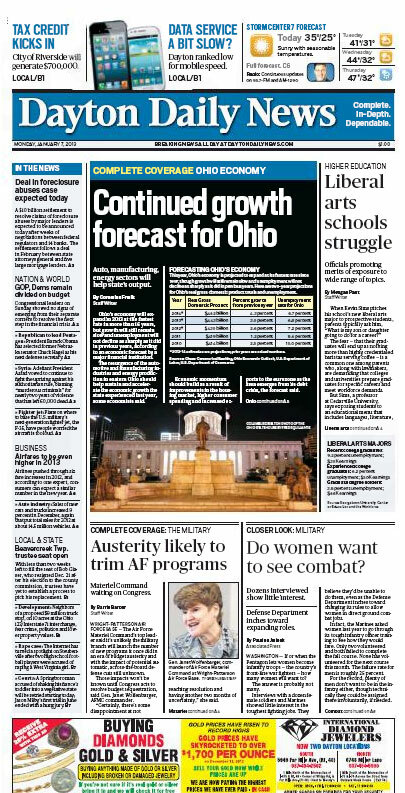 You can read a different newspaper every day for the rest of your life (well almost), travel the world without leaving your armchair, catch up with events in Mumbai, are scan the obituaries in Dayton, Ohio. I could go on about the advantages of PressDisplay, but it will begin to sound like an advert, and, whatever you might think, I am not being paid by them to write this. The purpose of this post is merely to point out the service to any other addicts there might be out there, and to give a Yorkshireman's nod of approval to the company providing the product. The other point of this post is to share with you something I was reading in the Mumbai edition of the Indian newspaper, Daily News and Analysis (DNA), this morning. Did you know that 7 people will killed by leopards in India last year? Now, that is interesting, isn't it? Big Moors - Big Mac. My screen saver this week is a photograph I took back in April 2008. 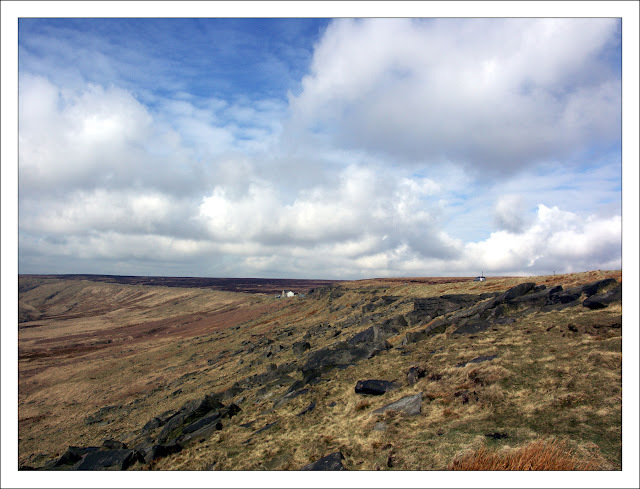 The moors might be Scammonden Moors or they may be Marsden Moors, strict borders and geographical labels are as rare as MacDonald restaurants on the tops. The A640, Huddersfield to Rochdale road, runs along the ridge. 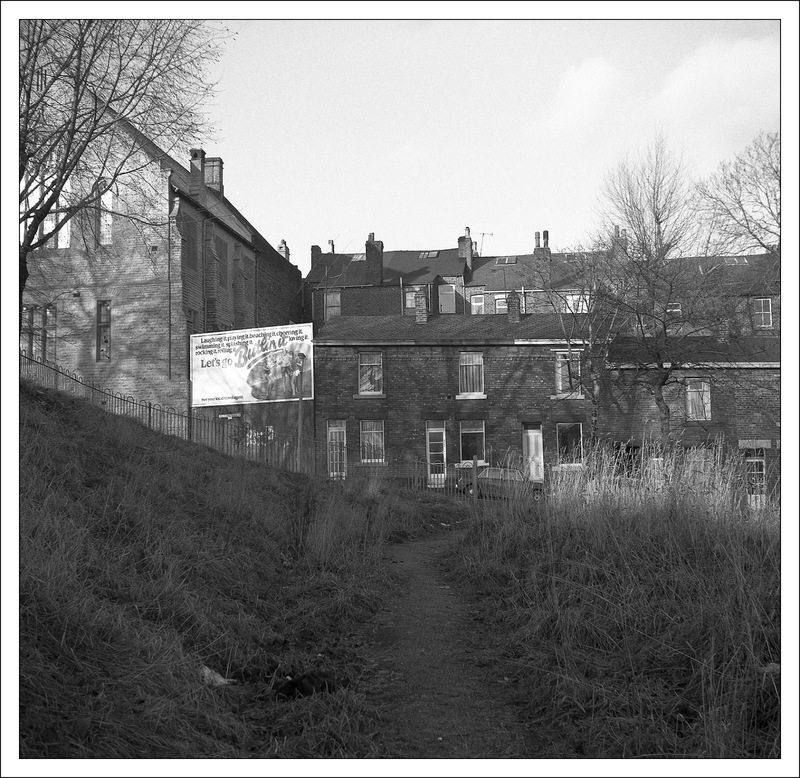 The white building in the centre is a farmhouse, although back in 2008 it was undergoing redevelopment. Perhaps it was being turned into a fast food restaurant. 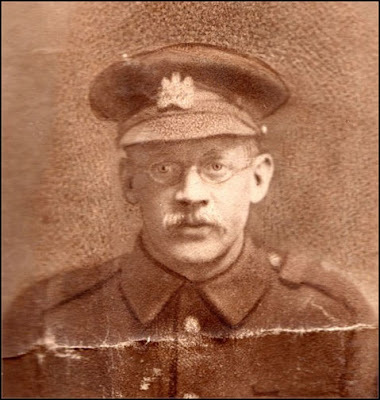 For my Sepia Saturday post last week I was trying to decide whether a young soldier in an old family photograph was my grandfather, Enoch Burnett. I do not have any pictures of Enoch as a young man, so I was left with guesswork and the helpful suggestions of other Sepians ("Sepian" = Sepia Saturday contributor). It was only after I had published the post that I thought of running the photographs through the facial recognition software which forms part of the Google photo-management suite, Picasa 3. If you have never tried the facial recognition on Picasa 3, it is well worth the experiment : the software is free to download, and once you identify one face it will work its way through all your photographs looking for a match. It is frighteningly accurate and mis-matches tend to have genetic roots (mistaking parent for child, or sibling for sibling). It is a powerful reminder of the power of genetics. I received another powerful reminder of genetics the other morning when I went for my bath. 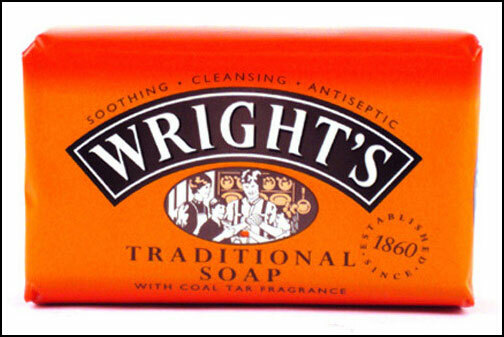 For years I have been addicted to Wright's Coal Tar Soap with its powerful aroma of thick tar and its enticing colour of congealed custard. Another great advantage is that I have never met anyone else who likes the stuff, and thus I am normally guaranteed my bar of soap, unpilfered by other hands, undiminished by other latherings. On reaching for the familiar bar of soap I discovered that it was gone : taken to the shower by a foreign hand. The Lad is back at home at the moment in the run-up to his Finals, and it didn't take me long to discover that he was the culprit. 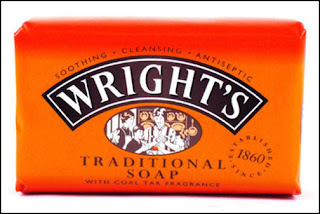 It appears that, unknown to me and almost independent of me, he has also developed an addiction for coal tar soap. Now that is the power of genetics. I must have taken this photograph in about 1970. Clearly it is Paradise Street. My first thought was that it was in Elland, but a quick search reveals no such street. But there is a Paradise Street in Halifax, now completely cleared of all its houses. So, now we know the location of paradise. 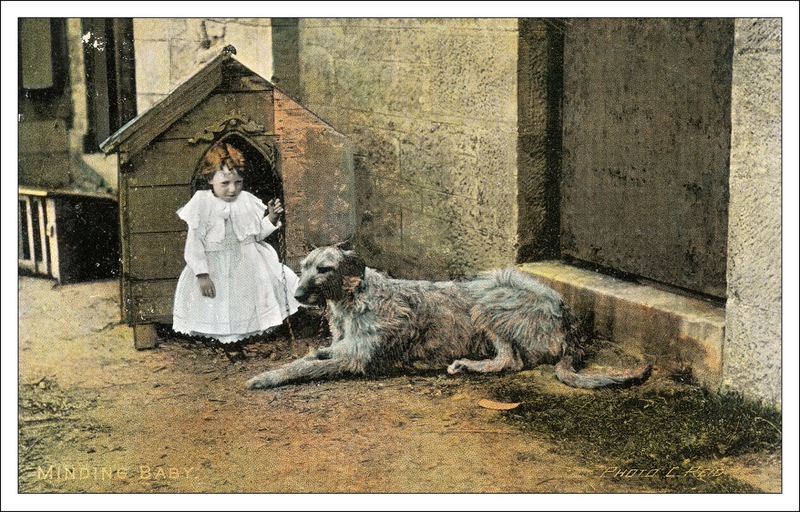 "Minding Baby" is the title of this early colour postcard. It was published by the Glasgow firm of Millar and Lang during the first few years of the twentieth century. 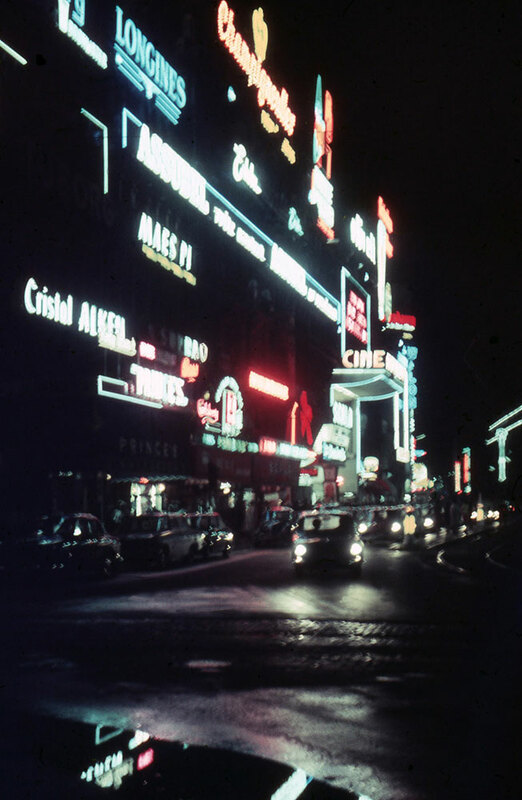 It was a time when colour photographs were produced by hand-tinting black and white images, and this gave rise to all sorts of strange shades and colour combinations. As far as I can tell, this particular image has never been scanned before, and therefore I am proud to make it available to the world via the Internet, free of charge and copyright free. Think of it as my contribution to our shared cultural heritage. I don't have all that many military pictures in my family collection. 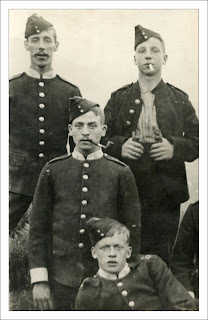 The two great fountain-heads of my collection of old photographs - my father and my mothers' Uncle Fowler - were both machine fitters and held back in reserved occupations during the great conflicts of the twentieth century. But I do have a couple of intriguing photographs which almost appear to be from an earlier age. My main photograph is so faded and out of focus that it is impossible to make out any detail on the uniforms or the flag. It is, however, in the family collection and, as I am the first annoying curator of that collection to add "outside" photographs, it is likely to feature a family member. 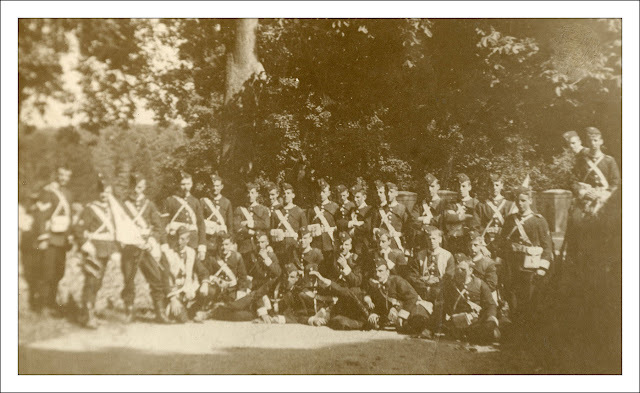 I have always wondered whether it included my grandfather, Enoch Burnett, and was of a training company of volunteers around the time of the Boer Wars. The second photograph is much clearer and it would seem that the uniforms are the same. The young chap at the bottom of the picture looks remarkably like my father in his youth, but the dates would all be wrong. I therefore wonder if it is, in fact, his father, Enoch. I have no other pictures of Enoch as a young man and therefore I have nothing to compare it with. Enoch was born in 1878 and therefore he would have been 21 at the time of the Second Boer War. By the time the First World War came around he was in his late 30s, and, as my final picture shows, looking much older than the youth in the photograph. So my fourth - or is it my fifth - year of Sepia Saturday starts off with a mystery, which is perfect, because that is what old photographs are all about: mysteries wrapped up in enigmas and printed in a faded sepia tint. Happy 2013 to all my fellow Sepians.